A man and a woman are getting ready to receive guests. A man is, of course, the artist himself: a round head, a square forehead, a thin triangular face, a mustache. He makes a list of guests. A woman is thin and tall, she places glasses. Strict black hostess clothes, dark backs of chairs, black bottles. White solemn tablecloth, chair, white lamp light. The warm colors of the habitable room from a dark brown wardrobe, a light brown wall and the same stools to reddish paintings on the walls. At the place of honor in the center, under the ceiling, on a white sheet is the children’s drawing of the artist. I believe that the artist enjoys the pleasant, slightly exhilarating expectation of the desired guests as a chance to reflect the habitual, modest situation of his home and his everyday objects. 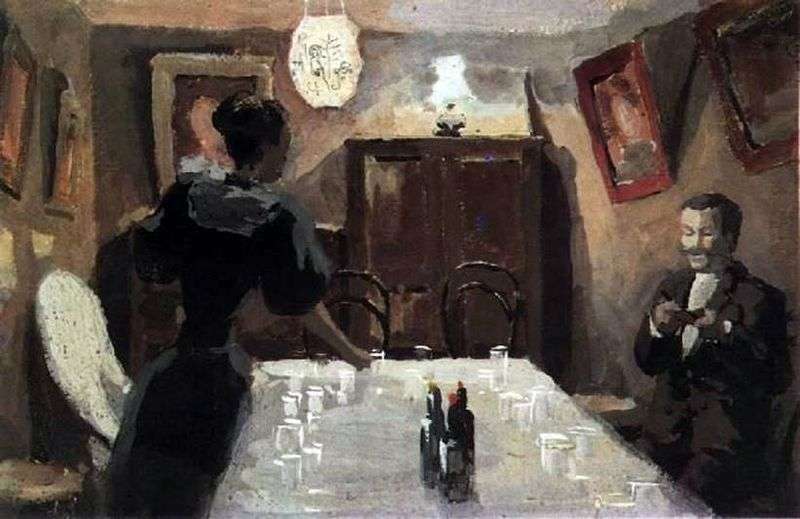 Description and meaning of the painting Waiting for guests by Victor Elpidiforovich Borisov-Musatov.